Whip spiders, considered by many to be creepy-crawly, are giving new meaning to the term touchy-feely. In two species of whip spiders, or amblypygids, mothers caress their young with long feelers, siblings stick together until they reach sexual maturity, and all mix in social groups. This is surprising behavior for these arachnids long-thought to be purely aggressive and anti-social, according to a Cornell researcher. 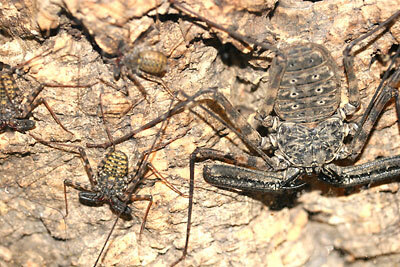 A mother amblypygid with several of her 7-month-old offspring. Their whips are touching one another. Social behavior is extremely rare in arachnids, a class that includes spiders, amblypygids, scorpions and mites, among others; only 76 (or less than 0.1 percent) out of the 93,000 known arachnid species have been observed living in social groups. The research, appearing in recent issues of both the Journal of Arachnology and Natural History magazine, marks the first time social behavior has been reported in amblypygids. "This was the best example I had ever seen of friendly behavior in an arachnid," said Linda Rayor, senior research associate in entomology and the lead author of both articles. Rayor describes in the articles how mothers habitually stroke their offspring with their long, thin whiplike front legs and how the siblings congregate in social groups. "I was amazed at how incredibly interactive the groups are," said Rayor. "They are in constant tactile contact with one another. They are constantly exploring one another and interacting with their siblings." Scientists have long thought these creatures were solitary and cannibalistic predators, as past studies have focused mainly on the adult's dramatic courtship and fighting behaviors. Rayor believes that because young amblypygids slip easily into tight crevasses and their coloring matches their backgrounds, the social behavior of the youngsters has been missed in the wild. Rayor's research on two species in captivity (the dime-sized Phrynus marginemaculatus from Florida and a much larger Damon diadema from Tanzania) suggests that both mothers and siblings form long-lasting, socially interactive groups. As soon as the siblings approach sexual maturity though (about 12 to 14 months of age), they start showing aggressive, life-threatening behavior toward each other. To test if D. diadema were congregating simply to inhabit a preferred site in the cages, Rayor and Lisa Taylor, CALS '01, created cages with uniform plywood surfaces and found that the siblings grouped together but changed their location daily, suggesting individuals preferred proximity to each other over a specific location. When siblings were removed from a familiar cage and scattered about another large unfamiliar cage, within minutes, they gathered back together. In one experiment conducted by Rayor and Rachel Walsh, A&S '05, when 7- to 9-month-old D. diadema were separated from their families and later returned to cages with either their own group or an unfamiliar group, they reacted more aggressively toward the new group than their own. Rayor suspects that benefits of whip spider social behavior include enhanced safety from predators. Although there are few reports of other creatures eating them, a mother nearby may offer young amblypygids some protection. When Rayor disturbed D. diadema youngsters, they gathered closer to each other or their mother. Now and then, the mother threatened Rayor. The adolescents, though, tended to scurry away and hide when faced with threat. While sharing prey is an advantage for other arachnids with social tendencies, Rayor said she has yet to witness amblypygids intentionally sharing prey. More than 100 amblypygid species live in tropical areas worldwide. These arachnids, whose bodies range from one-eighth to about one and three-quarters inches long, have two elongated pedipalps (like arms) in front tipped with stilettos that are used to capture prey. The first pair of legs has developed into long whiplike feelers that are three to four times longer than the remaining three pairs of legs. The exceptionally flexible whips can move 360 degrees around their bodies and are covered with hairs that sense their environment. Written from a news release by Cornell University .